Alarm Can be Set to Vibrate or Sound or Both. The easy-to-use e-pill VitaCarry timer can alarm up to times per day. The alarms automatically reset and can vibrate, beep, or both. The durable pillbox is water and airtight. This handy medication reminder and pillbox fits in your purse or briefcase. 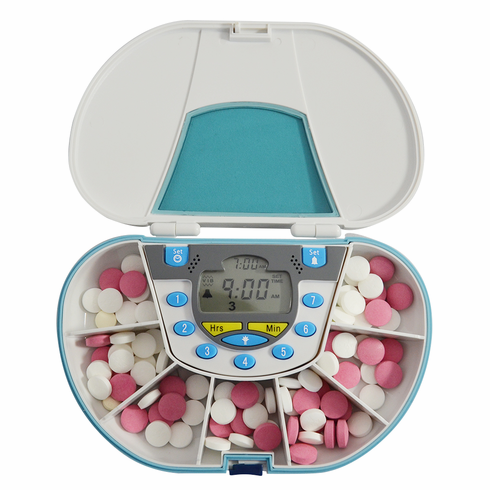 This e-pill 7 Alarm Vibrating Pillbox medication reminder has large pill capacity- each compartment holds 25 aspirin sized pills. Alarm duration (vibrating alarm/sound alarm / visual alarm or all three) up to 10 minutes. Missed pill feature is turned on after 1 hour. Easy to read display with backlight. Complete pill reminder system including Batteries. Size: 6 inch x 4 inch x 1 1/2 inch Weight: 7 Oz.